This April 2018 in-depth review (link below) by Car & Driver of the long-range, rear wheel drive Model 3 is worth reading if you are considering a Model 3. The review is the most comprehensive that I have read so far, and it should assist prospective buyers. However, some of the initial shortcomings mentioned in this early review have already been corrected by Tesla in Model 3s being currently produced. My wife and I own the same configuration as reviewed. It's an excellent review and for the most part I have no problems with it. However, in this article I will note any changes that have occurred since the review, or any differences in opinion that I have with elements of their review. The reviewers (from Detroit) devised their own fuel economy test that drove the car faster than typical posted highway speeds and took their measurements at 28 degrees Fahrenheit. Unsurprisingly the car didn’t meet the official published EPA results. At Florida temperatures, and traveling at posted highway speeds, this version of the Model 3 will probably go actually further than the EPA sticker value of 310 rated miles. We learned that the testing data that Tesla provided to the EPA would support an actual range of 334 rated miles, but Tesla asked EPA to list the rated miles as 310. We currently have 1,656 miles on our Model 3 which are much more miles than the reviewers had to perform their tests. From our trip odometer the average efficiency for our total mileage is 233 Wh/mi. This is significantly less than the published EPA rating of 270 Wh/mile. Bottom line: The car is extremely efficient and I believe the published 130 MPGe. I agree with the reviewers that the rear seating is uncomfortable, especially for taller people. Tesla has since revised the rear seating to address this issue. Although I haven’t used a decibel meter in our car, I am positive that the interior noise is nowhere near 69 decibels. Update: I used a free phone app to measure the sound levels in the car at 70 mph. The readings did not exceed about 50 decibels. We experience a very quite ride similar to our Model S.
Rear visibility is poor as the reviewers point out, but the high definition backup camera provides an excellent rear view when the car is in reverse and if needed it can be turned on when moving forward. The cargo and storage space is half that of a Model S, but nevertheless quite adequate for most situations. The Model 3 has certain storage and convenience features not found on the premium Model S such as door pockets, a rear folding armrest with cup holders and clothing hooks. The Model 3’s Center Console has quite a bit of storage space. At the time of the review there was no blind-spot monitoring or automatic high beams, but those feature have been added. The blind-spot monitoring is the same as in the Model S & X, but personally I find it to be of marginal value as currently implemented. I would prefer an indicator in the side view mirrors rather on the dash or center displays. The review incorrectly states, “When combined with an adapter and the Model 3’s onboard charger, 240-volt outlets can add between 11 and 30 miles per hour of charging,…” Whereas it is true that most public SAE J-1772 chargers rarely have a capacity to permit an EV to charge at more than 30 miles of range per hour, if you were to find a high-capacity public charger of 60 amps (11.5 kW) or more, the long-range Model 3 can charge at up to 44 miles of range per hour with a J-1772 adapter. We charge our Model 3 at home at this speed connected to a Tesla High Power Wall Connector rated for 80 continuous amps. For comparison, our Model S with a high capacity on-board charger charges at around 55 miles of range per hour. The review fails to mention that the new second generation Mobil Connector that comes with the Model 3. It plugs into either a 110 volt or 240 volt outlet and will only handle a maximum of 32 amp, or 30 miles of range per hour. If you have the first generation Mobil Connector, it will handle a maximum of 40 amps, or 37 miles of range per hour when plugged into your long-range Model 3. The review states, “…you do hear plenty of noise inside the cabin as the tires thwack and thrum when driving over pavement imperfections.” This is not my wife's or my experience. 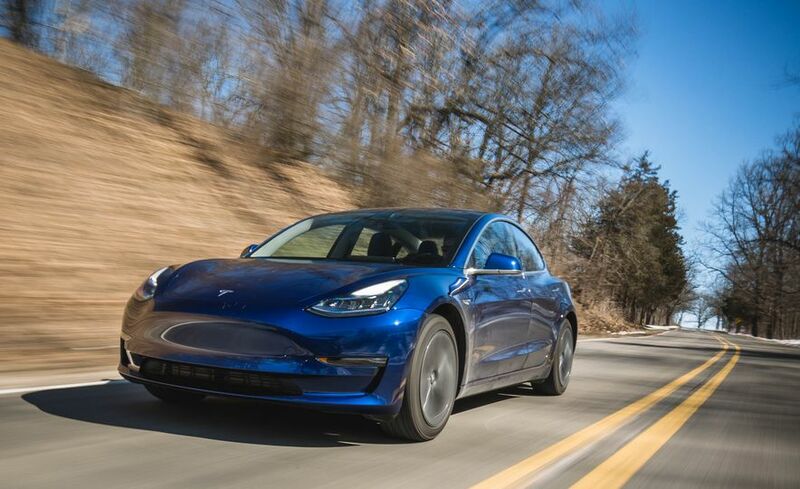 The review stated, “…we did notice a bizarre amount of variation in our test, which involves six consecutive panic stops—the third of these stops took an interminable 196 feet.” Consumer Reports (CR) were also critical of the braking on the early Model 3s. However, within a couple of days following the CR review Tesla was able to send out an over-the-air update to resolve the issue. In fact. CR was very impressed with the fix. Whereas I agree that in normal driving most drivers rely more on regenerative braking than mechanical breaking, I strongly disagree with their observation that regenerative braking can’t bring the Model 3 to a complete stop. I use one-pedal driving on both our Model 3 and S, and both have aggressive regenerative braking when set in the Standard setting. For safety when coming to a stop after using one-pedal regenerative breaking, I always also apply the mechanical brake (press the brake pedal) to ensure the car is firmly stopped. This will automatically set the Hill Hold feature which applies the electronic parking break to prevent the car from rolling on inclines. The brake is instantaneously released when pressing the accelerator. Whereas this is a personal taste sort of thing, I agree that the Model 3 while resembling a Model S is slightly less sporty looking. However, in their summary remarks they go on to state, ”Not-so-sporty, bloblike shape,…”. The remark “ bloblike” in my opinion is nowhere near the truth, but this is something prospective buyers can easily decide for themselves. Regarding the fit and finish we didn’t experience any problems with panel gaps, etc. In fact, the quality was slightly better than our Model S purchased a year earlier. The review accurately described the two means of gaining access to the car, the smartphone Tesla application and the backup card keys. Apparently they didn’t run into any problems. In our case, and in talking to other early Model 3 owners, gaining access could be a frustrating experience when relying on the phone app as the primary means of entry. In fact, my wife abandoned it entirely and devised a lanyard that she would wear around her neck with the card key attached. For the most part, the problems with the Tesla phone app resolved themselves within a couple of weeks’ ownership. Nevertheless, I prefer the key fob entry system of the Model S in which we never experience a problem. Well, that's it, we welcome your input. I will be publishing this article both as a Public and Private News article. For our club members, to leave a comment or ask questions, sign on to our website with your email address and password, then go to the Members-Only Club News version of the article. If you are a non-member and have a question, you can email me at lfchanin@gmail.com. Recently a club member located renovations in progress on the old Bob Wilson Dodge location at 11945 North Florida Avenue in Tampa. It appears to be a new or additional Tampa Service Center nearing completion about 14 miles from the existing Tampa Service Center. One of our club members located the following information from Tesla's Building Contractor, Scherer Construction. This status appears to be as of May 1, 2018. Their posted completion date of Summer 2018 appears to be optimistic. Our best information suggests it will be ready no earlier than October, 2018 or it may even open next year. square foot interior office space which will be used for vehicle delivery was also completed. The second phase is a new 30,000 square foot dealership and service center. The structure is made of tilt wall panels and will include 6 large overhead bay doors for the service center." Here's their most recent aerial photo as of May 1, 2018. Update as of July 12, 2018. Tesla has hit the 200,000th EV in July rather than June! Please scroll down to the bottom of this article for a current update. This article has been updated to reflect current sales data. 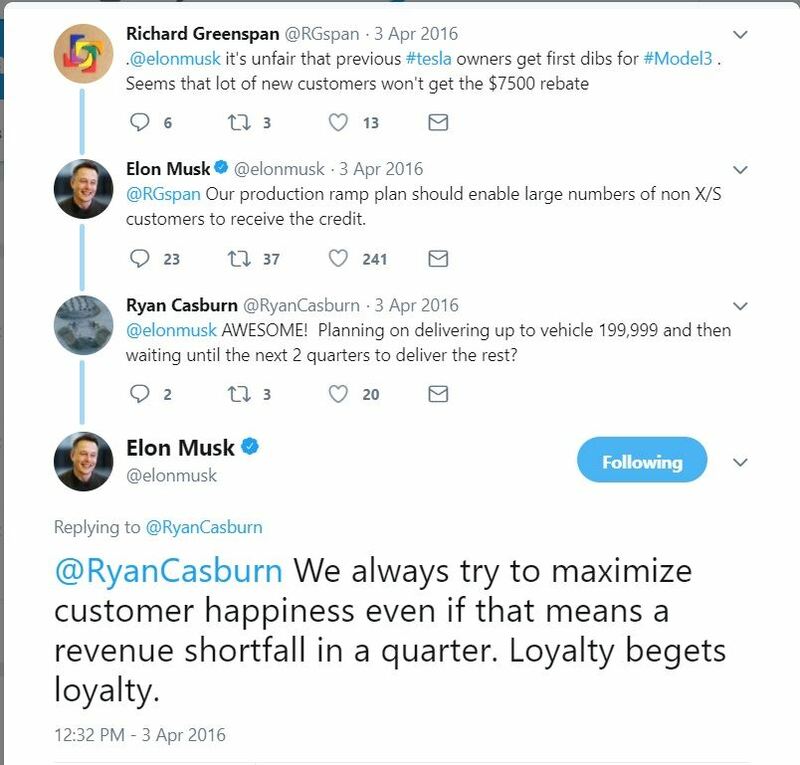 In Tesla’s first quarter 2018 SEC 10-Q report they stated, “…under current regulations, a $7,500 federal tax credit available in the U.S. for the purchase of qualified electric vehicles with at least 17 kWh of battery capacity, such as our vehicles, will begin to phase out over time with respect to any vehicles delivered in the second calendar quarter following the quarter in which we deliver our 200,000th qualifying vehicle in the U.S. We currently expect such 200,000th qualifying delivery to occur at some point during 2018." So the big question is, "In which quarter will Tesla reach that 200,000th qualifying vehicle in the US?" Where do we stand as of the end of May 2018? The source of these sales numbers are from InsideEV with the exception of the number of Roadsters sold in the U.S. In reviewing the above chart, Tesla is only about 6,200 EVs away from hitting the 200,000 tax credit phase out trigger. Even if Tesla were to freeze its U.S. production rate at the May level of about 9,220 total EVs per month, they would still hit the phase out trigger at about the third week in June unless Tesla were to shift a significant number of deliveries to Canada. If they do not shift enough deliveries and the phase out trigger is hit in June, then tax credits would be reduced by half starting in October, 2018. Will Tesla shift deliveries to Canada to prolong the US tax credit? Now, according to the article linked below from Electrek, that is precisely what Tesla is doing. "Tesla is evidently starting Model 3 deliveries in Canada in a massive way with large shipments being spotted throughout the country including one with an estimated 1,000 Model 3 vehicles in Toronto. In March, Tesla sent a huge first batch of invites to Canadian reservation holders." If Tesla can temporarily redirect a few thousand Model 3 deliveries to Canada during June and delay hitting the phase out trigger until July, the beginning of a quarter, then the full tax credit could be extended by another three months. Furthermore, there is no limit on the number of cars that would qualify for the full tax credit during the phase out period. So shifting U.S. deliveries to achieve hitting the trigger at the beginning of a quarter would result in more people getting the credit since Tesla is still ramping up production and therefore will be producing Model 3s at a much higher rate in the third quarter than in the second quarter. How Fast Will Tesla be Producing Model 3s? Bloomberg has a tracking system that estimates Model 3 U.S. sales. During May Bloomberg estimated that Tesla momentarily hit a weekly production rate at over 3500. However, as of May 31, 2018 they estimate that Tesla was producing at about 1,400 per week. From the InsideEV's May sales estimates, we can see that Tesla averaged at over 1,500 per week. Elon has plans for much higher production levels. In an internal memo to employees sent in mid-April, Elon stated that he expected weekly production rates in May to be between 3000 to 4000 per week, and between 5000 to 6000 per week in June. This hopefully will be achieved by a comprehensive set of production line upgrades and shifting to 24/7 operations. Whereas, it can be seen that Tesla momentarily hit their target rate for a week in May, that rate was not be sustained for the entire month. Whereas the estimated May Model 3 sales rate broke all Tesla records, it was nevertheless lower than Elon had hoped for. However, this temporary delay in the production ramp-up does have a silver lining in that it will assist in delaying hitting the phase out trigger. This coupled with the fact that Tesla has begun to significantly shift deliveries to Canada increases the chances of hitting the trigger in July at the beginning of a quarter. At that time, I have confidence that Tesla will be delivering at a total combined US and Canadian rate close to the planned rate of over 5000 Model 3s per week and that the full $7,500 tax credit will be available until the end of 2018. As we had hoped for, Tesla has hit the 200,000th EV in July rather than June and has officially announced this fact on their Electric Vehicle Incentives page. If Tesla had hit the phase out target in June, people with orders would have had to receive delivery by September 30, 2018 in order to receive the full $7,500 tax credit. By shifting large numbers of deliveries of the Model 3 to Canada, Tesla was able to move the phase out target to July meaning the availability the full tax credit is now an additional three months. So as the Incentives page notes, people taking delivery before December 31, 2018 will receive the full tax credit. Between now and year-end there is no limit to the number of EVs that Tesla is permitted to deliver and still receive the full tax credit. So as Tesla continues to ramp up Model 3 production rates exponentially, this 3-month delay in the phase out significantly increases the number of Tesla owners eligible for the full tax credit. This is especially true if Tesla can hit it's goal of 10,000 cars per week before year-end. Based on information provided on the Tesla Motors Club forum, a total of approximately 1464 Roadsters were sold in North America since the beginning of production in 2008 until the end of 2011. Likewise, an additional 780 Roadsters were sold in Europe and Asia during this period. So ignoring Canadian sales as de minimis, about 65% of total global sales were in the U.S. According to Tesla's 2012 SEC 10-K report, production of the Roadster ended in January 2012 and was no longer available for sale the in the U.S. after December 2011. In addition, according to a Tesla press release, in January 2010 Tesla displayed it's 1000th Roadster at the North American International Auto Show. We can estimate of that of that total of 1000 Roadsters, about 650 were sold in the USA before December 31, 2009. Therefore, we can subtract the 650 from the total Roadsters delivered in the U.S. between 2008 and 2011 (1464) to arrive at about 815 Roadsters delivered in the U.S. after December 31, 2009. We have a credible, but unconfirmed rumor, that the “Coming Soon” Supercharger Station at West Palm Beach, planned for this year, will be located at the PDQ Restaurant at 2015 Okeechobee Blvd, West Palm Beach, FL 33409. Here is a vicinity map. The New Fort Meyers Supercharger Station is under construction. The building in the background under construction is the new J&R Crab Seafood Restaurant. Please make sure to scroll down to the bottom of this article for periodic updates. A member of the SWFL EV Owners club has discovered the location of the “Coming Soon” Fort Myers Supercharger location. (This is a different location than the existing Fort Myers Supercharger Station located at Gulf Coast Town Center.) This new location is in the Colonial Square Mall. The Supercharger terminals are across Dani Dr from the Pollo Tropical. There are currently (June 15th, 2018) 13 terminals installed and they are adjacent to the new J&C Crab Seafood Restaurant. Below is a vicinity map. As you can see it is just off of exit 136 of I-75 not far from the intersection of 6 Mile Cypress Parkway and Colonial Boulevard. Update as of June 19, 2018. 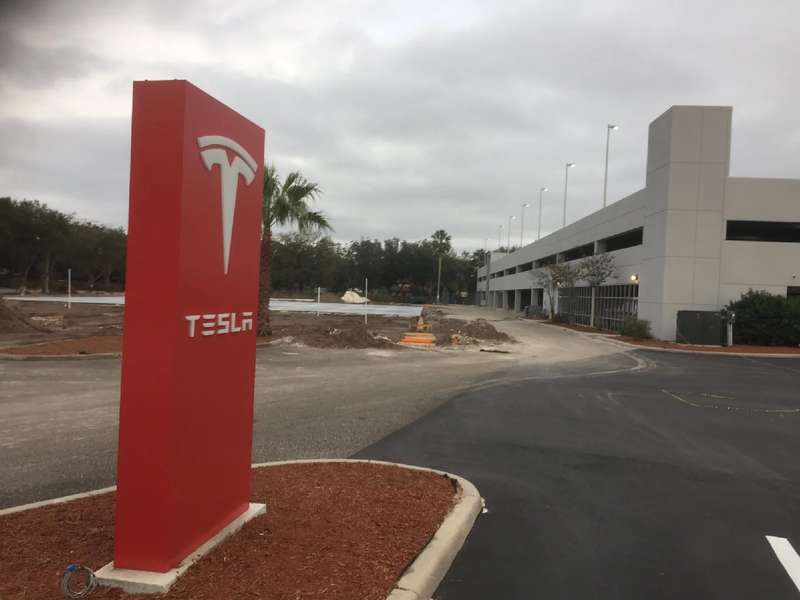 The SWFL EV Owners provided a photo and a video showing that there will be 14 Supercharging terminals at this new Fort Myers location. The following image of 7 Supercharger Cabinets confirms that there will be a total of 14 charging terminals. The new Fort Myers Supercharger Station is operational even though the Tesla Find Us map currently shows it as "Coming Soon". Update as of July 3, 2018. Tesla's Find Us page now lists the new Fort Myers Supercharger Station as operational. One of the members of the Tesla Motors Club forum noticed that the Tesla website shows the “Coming Soon” formerly named “Wynwood Supercharger is up and running about a mile away from Wynwood in the Design District. The Supercharger Station is located in the newly opened Museum Garage, located at 90 NE 41st Street, Miami, FL 33137. It appears to be a 14-stall station, but there is some uncertainty regarding the capacity of each terminal. The Tesla Find Us map states that the terminals are up to 120 kW, but the car’s navigation system currently states that they are up to 73 kW. The last new Miami area Superchargers located in parking garages were all Urban Style Superchargers and I am guessing that this new station may also be Urban Style. 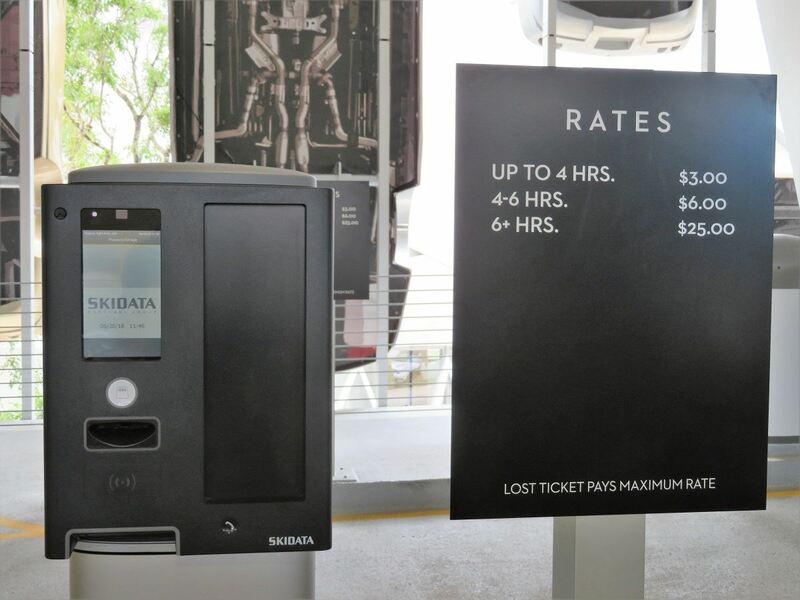 A recent local new article mentions that parking costs $3 for up to four hours. So we will need to find out whether there is any parking ticket validation process to reduce the parking fees at the Supercharger. Update as of June 30, 2018. The Museum Garage fee for the the first four hours is a reasonable $3, then $6 up to 6 hours and then it hikes to $25 maximum or for lost ticket. The Institute of Contemporary Art museum is across the street from the garage. It does not offer validation, but entrance is free of charge. The attendant said that perhaps in the future. there may be validation. The garage route is to drive one way up (to the 7th level) and then drive one way down another section of the garage to the exit. In my estimation I thought there were two very tight turns. One is close to the entrance and then one is close to the exit, an unusual stricture in such a large and spacious garage. Be careful in these two spots. On the way up and on the incline, approaching the 3rd level are five ChargePoint stations. At this 3rd level on the flat section there are eight Tesla Supercharger terminals. Continue up to the 5th level and there are six Tesla Supercharger terminals. Then on the way down, again at a 3rd level, there are six Tesla wall chargers. Here's a portion of the group that gathered to celebrate the opening of the Aventura Mall Supercharger Station. For this public event about 30 people including club members, their guests, some non-members and Tesla employees got together for a meet-up and lunch at Aventura Mall to celebrate the opening of the new Aventura Supercharger Station. We had a photo opportunity in the parking garage, where the 35 Urban style charging terminals are located. That was followed by a visit to the new Tesla store and lunch at the nearby Tap 42, a popular craft kitchen and bar offering indoor and al fresco dining. 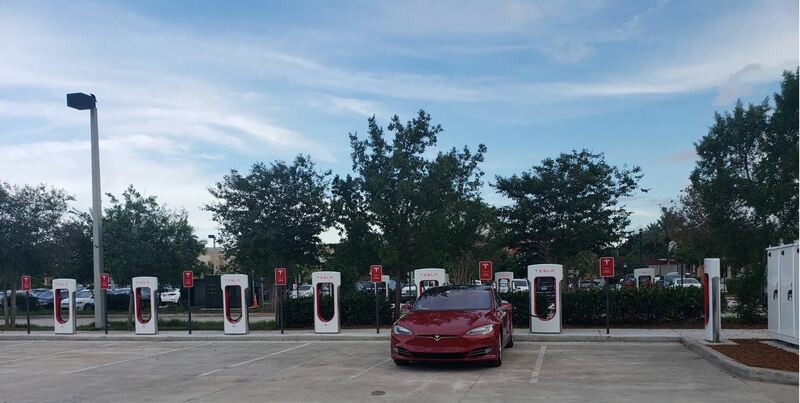 The "Coming Soon" Miami - Brickell Supercharger Station has been located by a member of the Tesla Motor Club forum and he reports that there are 25 charging stalls. THEY ARE STILL UNDER CONSTRUCTION. He reports that it is in "the lower level of the Brickell City Centre underground parking garage in lots A2 (10 chargers below Saks 5th Ave) and C2 (15 chargers north side of the garage). The electrician I spoke with working on the installation estimated they’d be ready in a month. This is a great location for people living/working in Brickell/downtown Miami, but visitors will have a hard time finding them. This garage is huge, so it’s unlikely there will be de-ICEing issues with these." This is the first urban Supercharger location in Florida and appears to have a total of 25 charging stalls. Urban Superchargers have a lower capacity than Superchargers located along major highways, 72 kW versus 120 kW. Here's some additional photos that he took. Update as of December 2, 2017. The cabinets for the 10 chargers below Saks on level A2 are in place. The cables have not been installed although they are all present. All the equipment is physically installed but not connected. The site is not directly visible since it is covered with protective screening. I went behind, but could not take photos because my guide was exceedingly nervous that i was there at all. The 13 cabinets on C2, Aisle 10 are being wired right now. there were several electricians working connecting the wiring. They would not allow photos either. They did say they expected to complete their work on both sides before December 15, including inspections after which FPL still must complete their connection and turn on power. The electricians said they and Swire Group (Brickell City Center is theirs) were intent on having them all working before Christmas. Update as of December 30, 2017. Despite the Tesla website showing an opening at the end of 2018, a recent photo shows that the A2 level looks to be nearing completion. The Tesla website and the navigation systems in the Tesla fleet show that 13 Supercharger stall are now operational, indicating that the stalls are on the C2 level. Tesla is now referring to this location as Miami, FL - SW 7th Street, rather than Miami, FL - Brickell. Today a member on the Tesla Motors Club forum confirmed that the 13 Superchargers were operational and provided the following photo. Presumably the remain 10 stalls will be energized at a later date. Please note the green light on the charging port and the Urban style charging stall. The remaining 10 Urban Style Supercharger terminals have been energized. 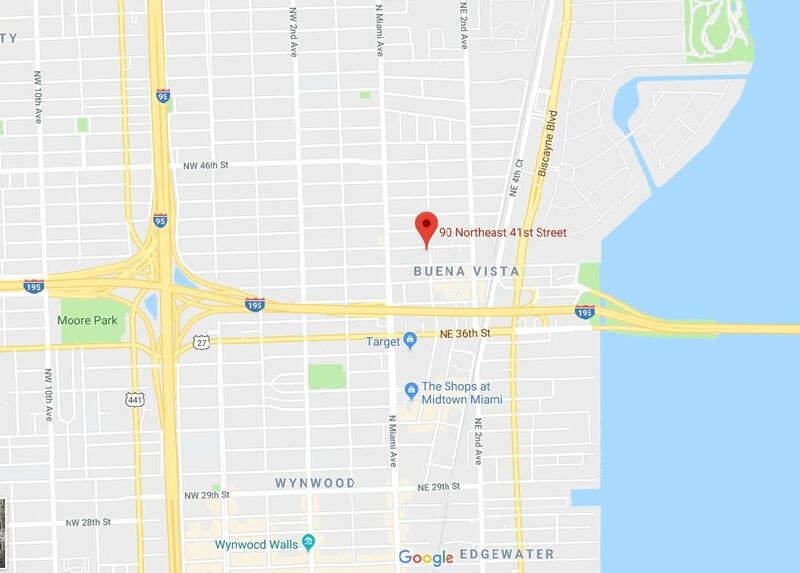 Tesla now refers to this location as Miami - SW 8th St.
Scroll down for updates to the original article. In a previous news article we reported that we believed that the Aventura Supercharger originally planned for 2017, now by the end of 2018, would be going in the new Parking Garage that was recently built as part of the new expansion at Aventura Mall. We will follow developments and provide a photo when it is available. Update as of March 27, 2018. A member of the Tesla Motors Club forum took the above photo in the new parking garage at Aventura Mall. He noted 20 "white boxes" which are Supercharger Cabinets. 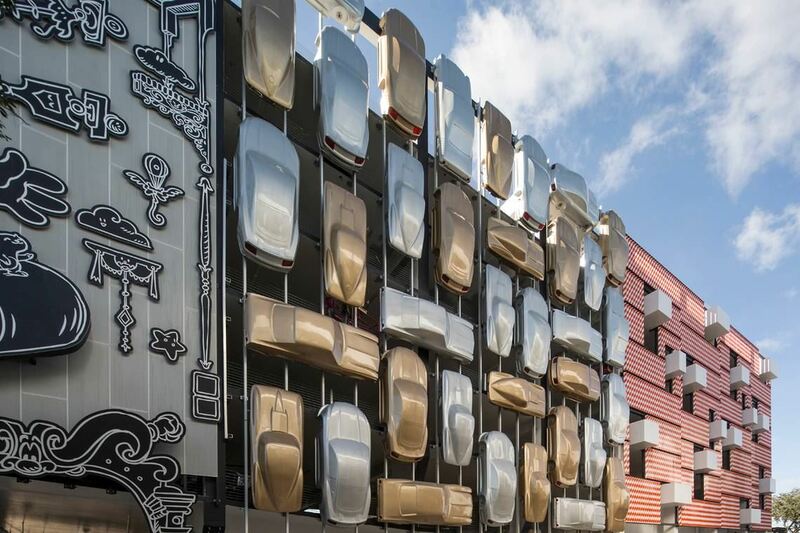 This means that this location will have 40 charging stalls!! Photos posted on the Tesla Motors Club forum confirm that this will be an Urban Supercharger Station. There appears to be two sets of 20 charging terminals currently installed. Here's one bank of 20 terminals. Here's one of two rows of 20 Urban Supercharger charging terminals. On the extreme right you can see some of the Supercharger Cabinets. 35 Urban Supercharger terminals are operational as of May 17, 2018.